In May of this year, several events took place pertaining to fashion, entertainment and helping towards a cure. 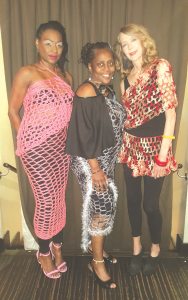 Dr. Genevieve Yarrell-Harris participated in the events, by including her crochet clothing line, appearing under the label GLUV, at Casa La Femme in New York City! As consultant and entrepreneur in the fields of education and psychology, Dr. Yarrell-Harris will continue to use her professional expertise, skills and talents to contribute to organizations working to help heal several potential debilitating illnesses (crochet for cancer, diabetes and lupus). On May 29 Dr. Yarrell-Harris joined other colleagues, professionals and students at Columbia University in New York City to discuss world peace, along with several representatives from different countries and organizations. The focus included, but was not limited to, declarations of peace, mission and visions for the future as well as peace education. Two great international stars: Shaggy and Sting, graced the stage in New York’s Central Park with an electrifying reggae pop style! Promoting their latest recording album 44!876 (yes, the title of the album is numeric, and is making it to the top of the charts in Europe). In the United States, Dr. Yarrell- Harris had the pleasure of meeting and speaking with several artists after their performance, and is proud to promote these two cultural music icons (see photo up). Stay tuned as the beat goes on!